This week my sons and I are off for spring break and I have high hopes of catching up on some small organizing jobs around the house as well as some long overdue blog posts! Since we have five days off I thought I would try to purge five bags or boxes of "stuff" - one per day. Check back every day this week to see details on which area of my house I'm tackling, and then join me on Saturday to see if I have managed to purge 5 bags in 5 days! Check out Day 1 here. Check out Day 2 here. Just a quick check in to show my progress today. I did a quick overview of the toy and book situation this morning and was pleasantly surprised to find that I didn't have as much to go through and get rid of as I thought. 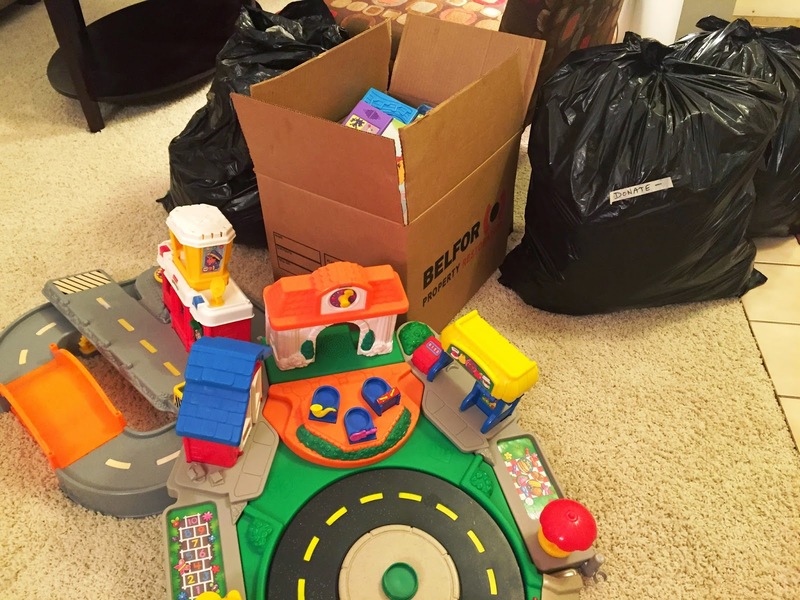 I had done a major purge last fall in preparation for having new carpets and floors installed throughout our house - it was almost like a move as we had to pack up most of our belongings and get them out of the rooms and into the garage or basement. As I packed and unpacked, I got rid of a tonne of stuff! It seems like once you do a big purge, its way easier to keep on top of things by doing quick, regular check-ins. Nevertheless I was able to box up several small toys the boys do not play with anymore, and quite a few books. The two "Little People" sets will go off to my nephew and the box will be dropped off with the bags of clothes from the past couple of days. As you can see, my pile is growing! That's it for now...I'll share some toy organization ideas in the future, but I'm heading off to tackle bathrooms today...specifically medicine cabinets and under sink storage areas. I don't think there will be much in the way of donations, but I'm banking on some serious recycling and garbage. Have a great day!